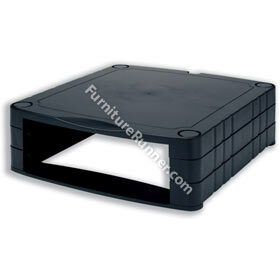 Stackable monitor stand lifts CRT or LCD monitors to comfortable viewing height Creates storage area under monitor. Multiple stands can be locked together for additional height and storage. Monitor can be raised from 30mm to 100mm. Dimensions (WxDxH): 306x338x67mm.